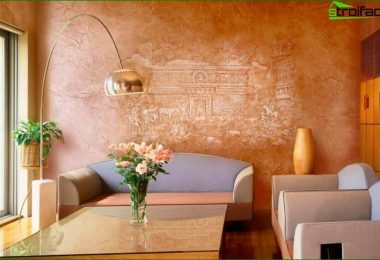 Wallpaper for painting deservedly considered one of thethe best materials for walls and ceilings. Painted wallpaper practical, possible multiple repainting, they are easy to clean. 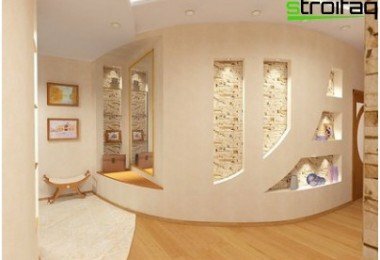 In addition, these wallpapers are beautiful - structural surface allows you to hide minor imperfections and obtain interesting options for wall design. It is impossible not to note the effect of a seamless surface. 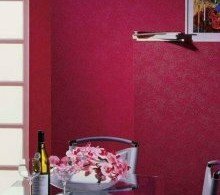 If you also decide to use for decoration of this popular material, but do not know how to paint wallpaper for painting, this article will surely help to orient. All wallpapers are designed for painting - moisture resistant, so they can be painted many times. To apply water-dispersion paint or alkyd paint. Despite the fact that different alkyd paintshigh wear resistance, their use in residential areas is not desirable. This is due to airtightness of the obtained coating. Wallpaper, painted latex paint environmentally friendly. 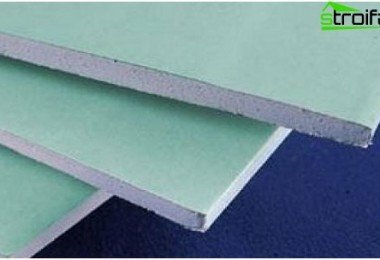 fiberglass wallpaper paints stained the same as non-woven, but first must be primed wallpaper (in order to reduce ink consumption). First of all, it is necessary to calculate the amount of paint,which is required for staining. To do this, measure the area to be coated. Then, by simple arithmetic calculations we obtain the required amount of ink by multiplying the consumption of paint (usually indicated on the bank) on the painted surface area. 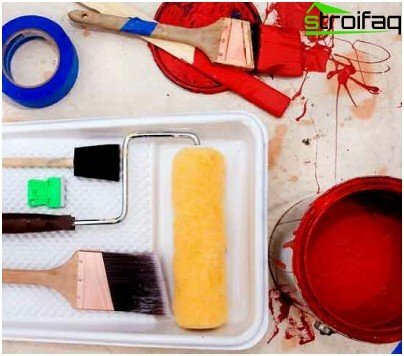 It is important in the calculation into account the fact that usually several layers of paint in order to cover the surface of the paint. It is better to buy the paint with a margin. It has come in handy after the repair for the restoration of the fine (for example, to paint a greasy spot at the wall switch, or to draw a child). Tinting. Latex paint on sale only in white. In order to obtain the desired color in the color added thereto. The entire amount of paint tinting immediately. If the paint is not enough, get in tune again be problematic. 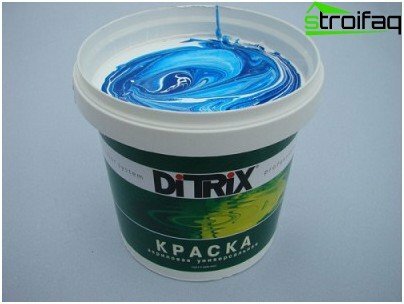 It is advisable to mix the paint and color with the help of the construction of the mixer (for content uniformity). Surface preparation. 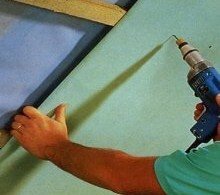 If the stain has to be painted before the wallpaper, it is important to verify the integrity of the coating: glue wallpaper exfoliated, putty the cracks, as well as clean up the irregularities of the previous painting. The boundaries of the painted surface should be to stick masking tape. Painting. Wallpaper paint technology is a little different from the way other surfaces painting: the paint is applied paint rollers. Places that are difficult to paint roller (corners, at the switch on the ceiling) dokrashivayutsya brush. If necessary, repeat the application layer should wait for the complete drying of the previous one. The above describes the simplest way to color wallpaper. 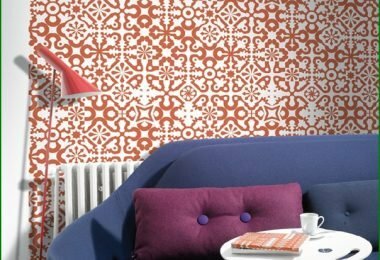 If you are wondering how to paint the wallpaper in an unusual way, you look below some tips for surface finishes. Non-woven wallpaper can be painted before pastingon the back side of the wall. Strange at first glance, but the point is this: the porous structure flizeline soaking paint forms a background wallpaper on the front side, while the waterproof vinyl spray does not stain, keeping the white. Thus it is possible to obtain interesting textured surface. A similar effect can be achieved ifuse multiple shades of paint at the first painting wallpaper using a roller with a long nap (for a thorough staining), and at repeated - short nap roller. 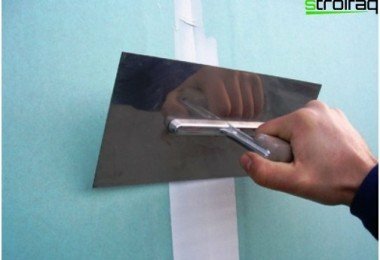 This method requires accuracy, as a second layer of a different color of paint, it is important to avoid hard pressure roller for secondary painting. As you can see, painting wallpaper - it is a simple,Special skills are not required. The painted surface you need to quickly and accurately, avoiding too much paint application (to the wallpaper does not stick).